Proliferating classification methods in DNA microarray studies have resulted in a body of information scattered throughout literature, conference proceedings, and elsewhere. This book unites many of these classification methods in a single volume. In addition to traditional statistical methods, it covers newer machine-learning approaches such as fuzzy methods, artificial neural networks, evolutionary-based genetic algorithms, support vector machines, swarm intelligence involving particle swarm optimization, and more. Classification Analysis of DNA Microarrays provides highly detailed pseudo-code and rich, graphical programming features, plus ready-to-run source code. Along with primary methods that include traditional and contemporary classification, it offers supplementary tools and data preparation routines for standardization and fuzzification; dimensional reduction via crisp and fuzzy c-means, PCA, and non-linear manifold learning; and computational linguistics via text analytics and n-gram analysis, recursive feature extraction during ANN, kernel-based methods, ensemble classifier fusion. 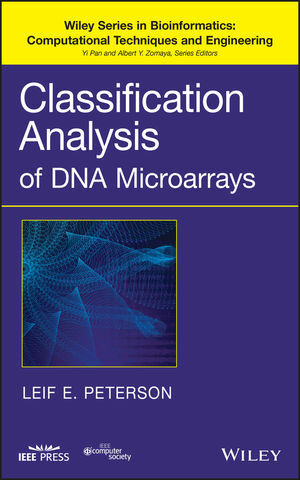 Classification Analysis of DNA Microarrays is useful for professionals and graduate students in computer science, bioinformatics, biostatistics, systems biology, and many related fields. LEIF E. PETERSON, PhD, is Associate Professor of Public Health, Weill Cornell Medical College, Cornell University, and is with the Center for Biostatistics, The Methodist Hospital Research Institute (Houston). He is a member of the IEEE Computational Intelligence Society, and Editor-in-Chief of the BioMed Central Source Code for Biology and Medicine.